Blake Paystrup has been called to serve as a missionary for The Church of Jesus Christ of Latter-day Saints in the Vancouver, Washington mission. He leaves for the Provo Missionary Training Center on Jan. 31, 2018. Elder Paystrup will speak Sunday, Jan. 28 at 11 a.m. in the Eastridge Ward sacrament meeting, Tooele East Stake Center, 752 N. 520 East. 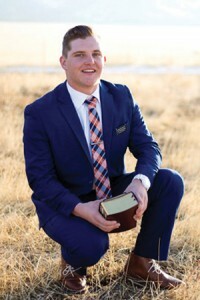 Elder Paystrup is the son of Jason and Dyanna Paystrup.